I know this is a bit late, but I made this on Fat Tuesday, so my hubby said I should call it Fat Tuesday jambalaya, so there you go! This was so good! I love my other jambalaya recipe, but when I started to make it last night, I didn't have half of the ingredients, so I came up with a different one! This one is a bit easier and tasted equally as good. All of my family gobbled it down and enjoyed mini king cakes for dessert. Mix worstershire, cajun spice, and chicken in a bowl. Let sit for a couple of minutes while you dice the veggies. Heat the oil in a large pot over medium-high heat. Add the chicken to pot and cook until no longer pink. Transfer the chicken to a plate and set aside. Lower the heat to medium and add the sausage. Cook, stirring often, until browned, about 3 minutes. Transfer the sausage to a paper towel-lined plate and set aside. Lower the heat to medium-low and add the chopped vegetables and garlic to the pan. Cook, stirring occasionally, until the vegetables have softened, about 4 minutes. Add the rice, salt, thyme and cayenne; cook, stirring constantly about 1 minute. Add the whole can of diced tomatoes and chilies, chicken broth, bay leaves, cooked chicken, and cooked sausage to the pot. Stir to combine. Bring the mixture to a boil, reduce the heat to low, cover and let simmer for 20-30 minutes until most liquid is absorbed, stirring occasionally. 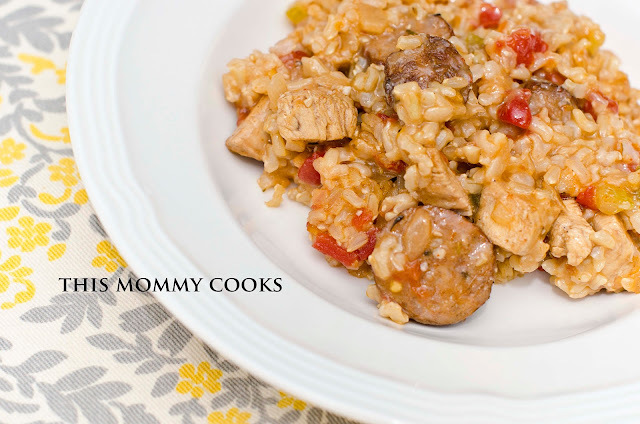 Your Jambalaya brings back memories of our trip to New Orleans; have always wanted to make it. I have copied your recipe and will try it during the week. It looks like just the kind of thing my family loves. If it works out I will post it on my blog and give you the credit. Thanks. This is so delicious! I added a red pepper and used turkey sausage...came out amazing!